I am thrilled to be able to offer all of the arrangements on Portraits of Hope for sale. They all come with the orchestration soundtracks. Play them in your home or perform them in your church! Are these the same soundtracks used on Portraits of Hope? Yes they are, and these are also the exact soundtracks that I use in concerts. 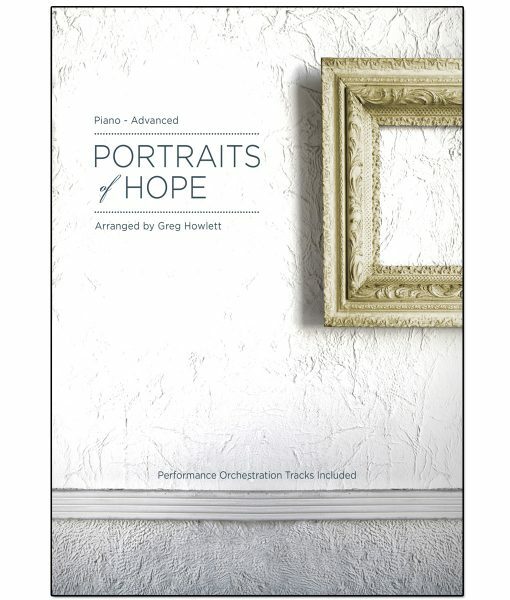 Are the written arrangements exactly as you play them on Portraits of Hope? They are very close. I never play these songs these exactly the same way twice. But when writing these out, I did try to match them to the recording as much as possible. You will note very few if any differences. Why is this book more expensive than other arrangement books? Because it comes with soundtracks. Soundtracks are very expensive to produce. Songs such as “To God Be the Glory” cost thousands of dollars each in studio and musician time. Can I perform these along with the soundtracks in my church? Is it hard to play with a soundtrack? It definitely takes some time to get used to it. But with practice, it sounds great and is a lot of fun. Are the written arrangements hard? Note the sample pages above. I have tried to include pages that are representative of the difficulty of the song. That being said, many of these arrangements are going to be challenging for most pianists. What are the technical requirements for playing and performing with soundtracks? Can these arrangements be performed without the soundtracks? Four of the arrangements can be performed without soundtracks if you have access to musician(s) who can play the obbligatos. The obbligatos are single instrument parts for violin, cello, flute, and oboe that are written to complement the arrangements. However, these arrangements will not work unless you use either the obbligatos or the soundtracks because the piano does not always play the melody.